I had a terrible night’s sleep. Loud music from car stereo, people talking and then the church bells started ringing at 4 a.m., and at 4:30 a.m. was the call to pray and then at 5 a.m. some kids started playing football. At 6:30 a.m. I started cycling for the border. Early Sunday morning people were already in church and the singing sounded nice as I passed by. The streets were busy with lots of people all dressed up and heading for church carrying their bibles, as usual everyone said hello. Somehow I left Atambua on the wrong road. It must have been an old road to the border because it was very thin and in bad condition. It was nice though taking me through some small villages. It also took me up a steep mountain and from the top I could see the ocean again. Going down the other side was very steep and with the brakes full on I was skidding. At 8 a.m. I reached the border and spent my last Indonesian Rupees on breakfast. then cycled up to the Immigration on the Indo side. Documents presented. The officer got his calender out and was very excited……….you have overstayed by 2 days – problem. I replied – no problem no I haven’t. He counted again. One day $20. I replied no 60 days. I am fine. His reply was take a seat and wait here. He kept baiting me with you have problem over and over again. I just kept replying No I don’t. I then made my own calender. I went right on the defensive and then straight on the attack. I usually keep very calm. But I wasn’t going to let them have one over on me. I raised my voice to a level that it drew another immigration officer into the room. With him we counted the days again and the outcome was okay – no problem and I was on my way. It was then a few km down to Timor Leste Immigration. They have just built a brand new complex which is not open yet. 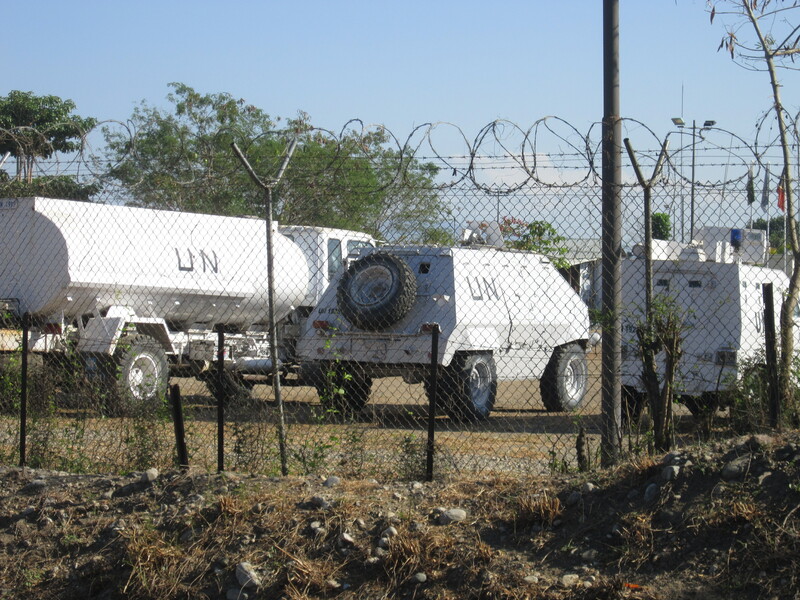 You bypass that to get to some old UN containers – formalities here were a lot easier. This side of the border is pretty dry. I crossed a couple of dry river beds. Everything looks a lot more basic – the people and the houses. There is more rubbish around. From the border I took a 21 km detour up the very beautiful mountain road to Balibo which is notorious for the deaths of 5 Australian journalists (one of whom was a New Zealander) in 1975 after the invasion by Indonesia. 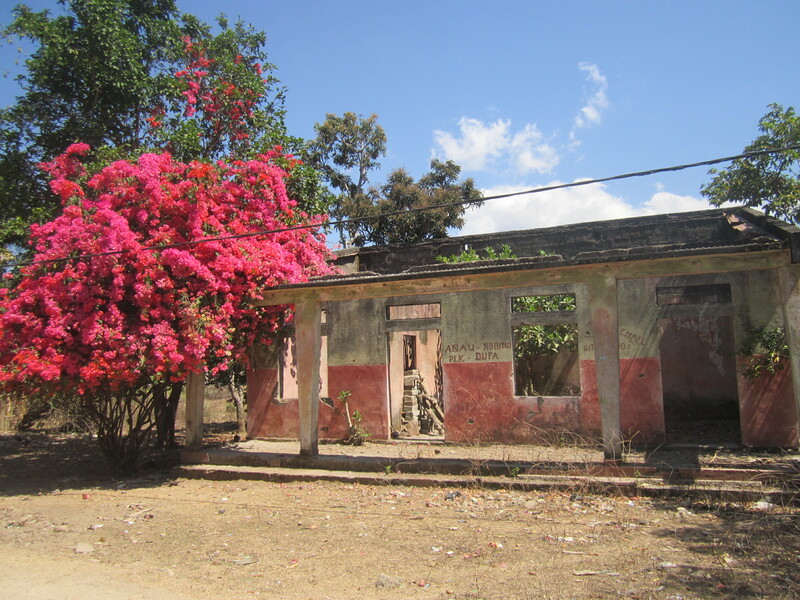 Then in 1999 much of the town was destroyed when Indonesia took out its frustration on the Timor people for voting for their Independence. Indonesia destroyed as much infrastructure as they could before they left. 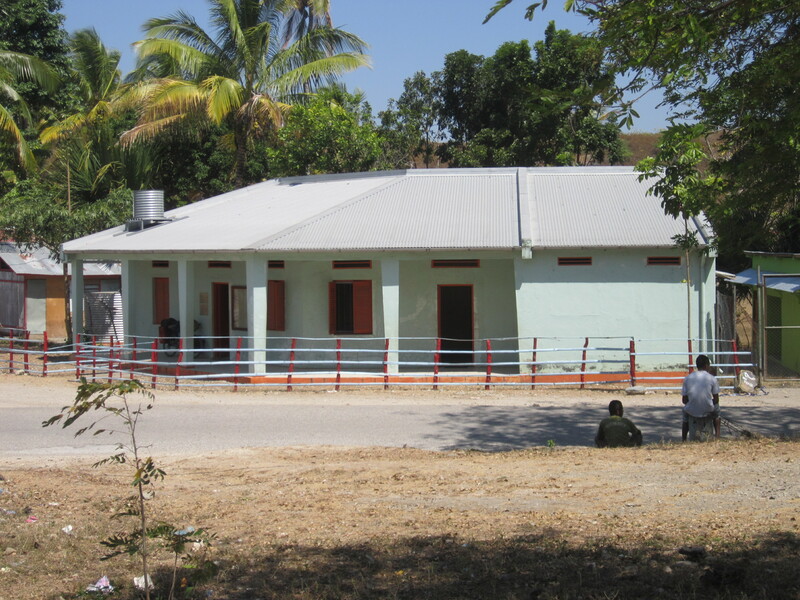 I visited the Balibo house museum before taking a walk around the village. Many destroyed houses were still prevalent. I also walked up to the 400-year old Portuguese fort. 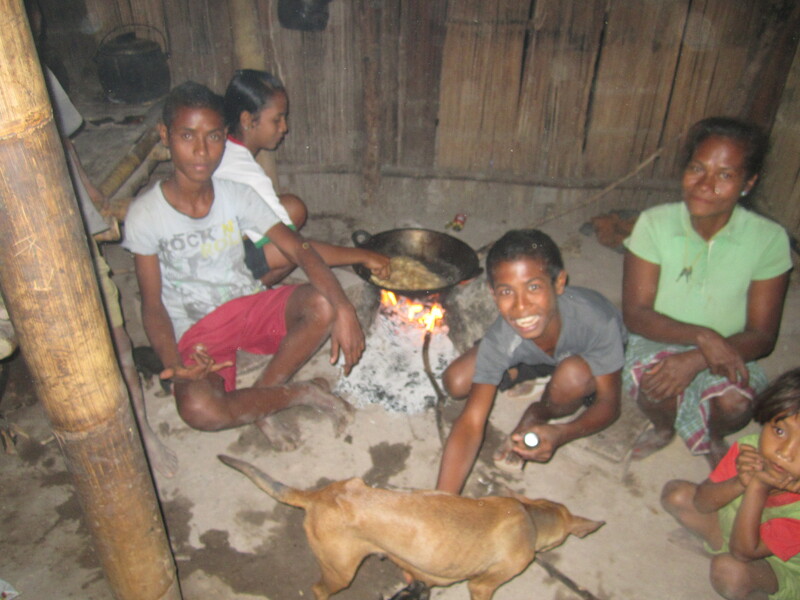 Finding a hot meal is not so easy – there are no restaurants in the whole village. I had to settle for 6 doughnuts which set me back a whole $0.30. I was then going to head back down the mountain and head in the direction of Dili. Instead I stopped outside the church and asked if there was anywhere to sleep. Good result – I now have a free room in the convent with the sisters. 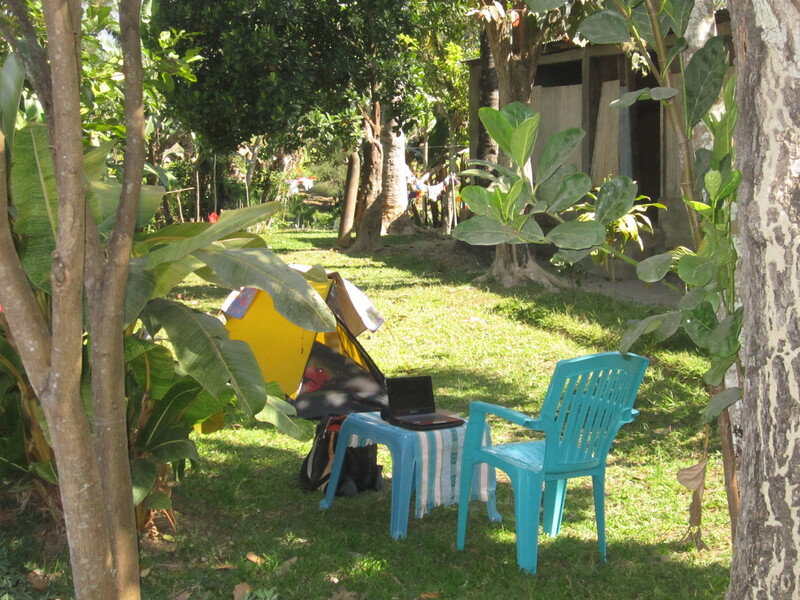 From out the back I am sitting at a table under the shade, drinking tea, eating fresh bread while watching locals climb banana trees. The accommodation in the convent was very comfortable and clean. There was even a mosquito net. In the early morning I got a visitor. 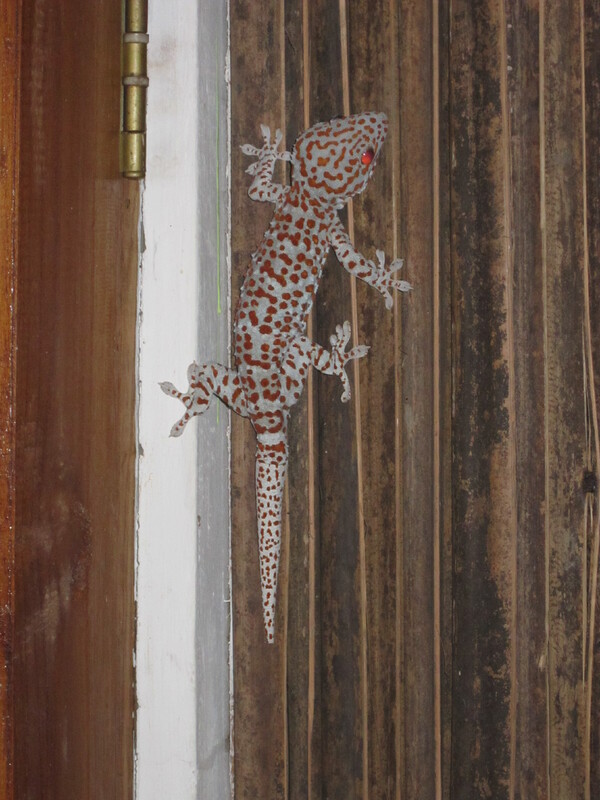 I switched my torch on and on the ceiling was a 250 mm lizard hanging on the ceiling. He wasn’t too bothered by me because in the morning he was still around. 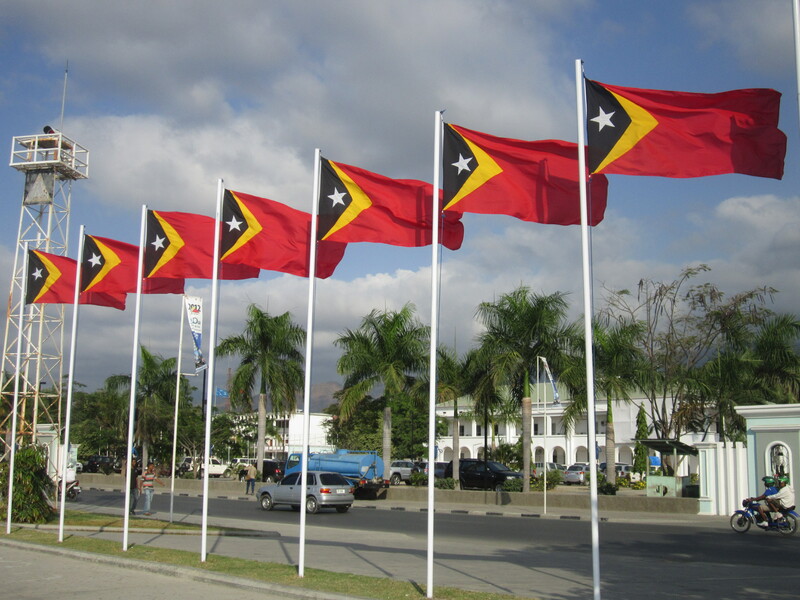 I have arrived in Timor Leste with no maps. So I am winging it a bit. I had two options this morning. 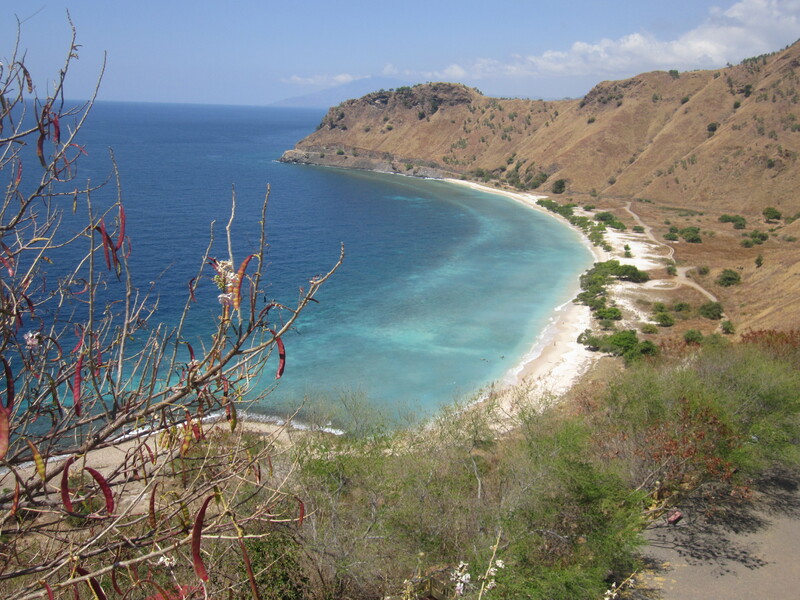 1) cycle back down the mountain and continue along the coast to Dili. The coast road must be new because my GPS does not show it. 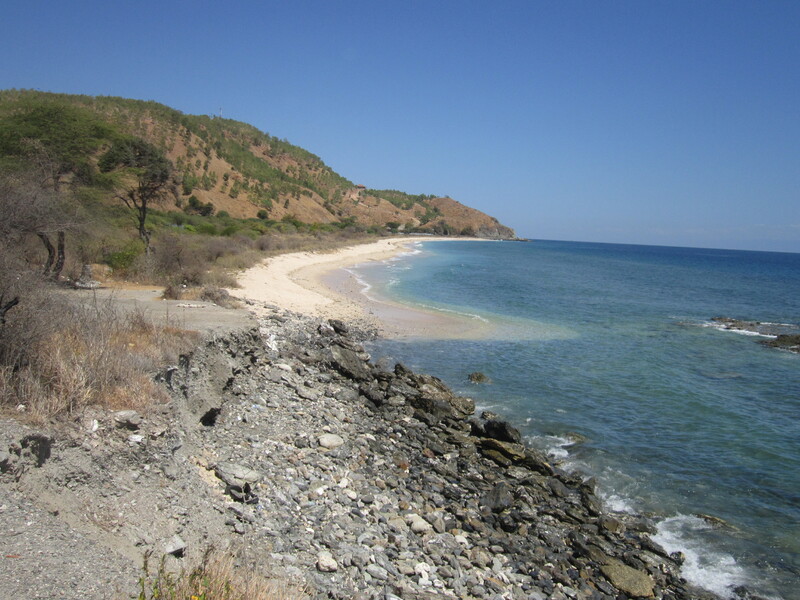 2) continue up over the mountains and then down to Dili. I chose the second option. After 5 minutes of cycling up, I was then on my way down a single track broken seal or just gravel road that followed the contours of the mountain in and out. 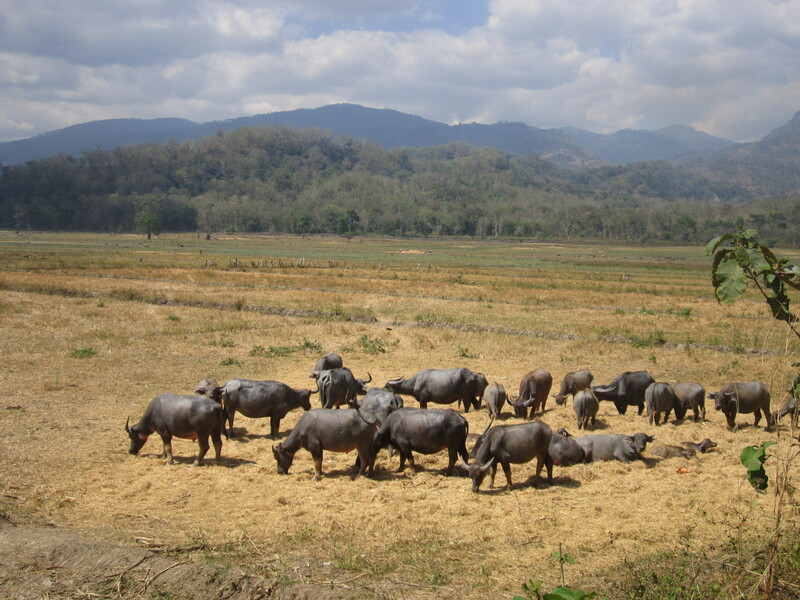 Along the way I passed many small villages and on more than one occasion I had a pig or piglets cross in front of me. The roads are pretty quiet. Saying that I have seen a few UN vehicles floating around. When I got to Maliana there is a big UN base and a whole compound full of vehicles. 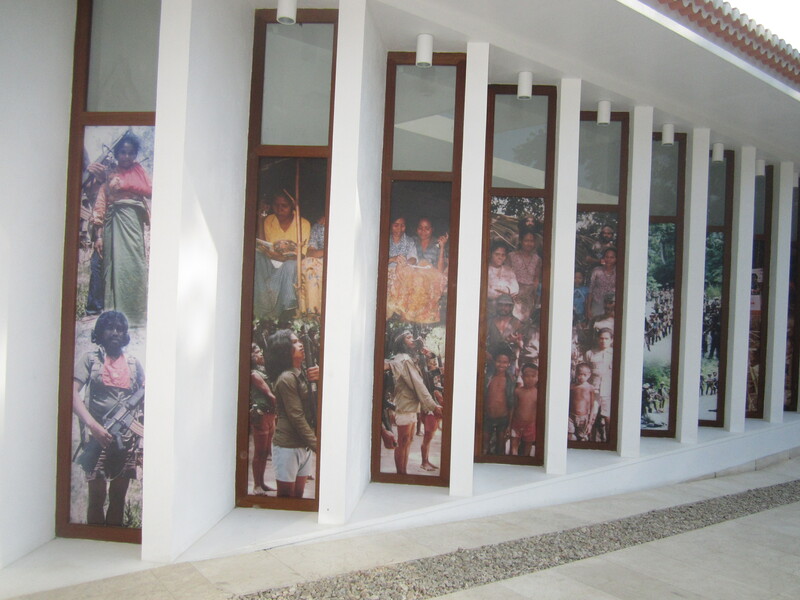 It is where the Australians were based when they were in Timor Leste. Finding restaurants in Timor Leste is difficult. I asked some locals on the way out of Maliana because I was a bit concerned it would be a long time to the next village. They took me into a small village. Next minute, I was sitting down to eat with the grandfather. Presented was an array of root vegetables. Sweet potato was the only one I knew and I got what I thought was going to be a hot glass of milk. The thought of it coming freshly from a goat or cow out the back worries me. Taking a sip I was pleasantly surprised. It was very sweet and was more like baby formula. 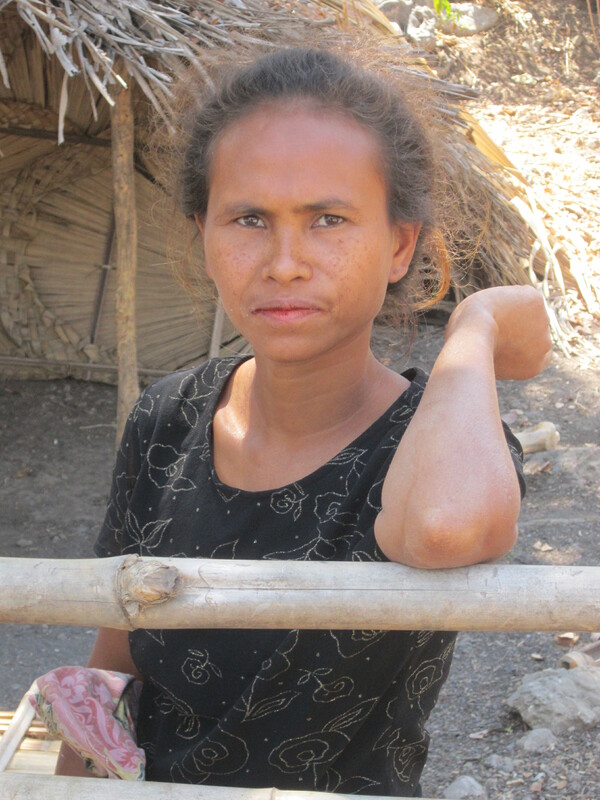 I then had trouble leaving Maliana when asking for directions for Dili. Everyone kept telling me to go back the way I had come. 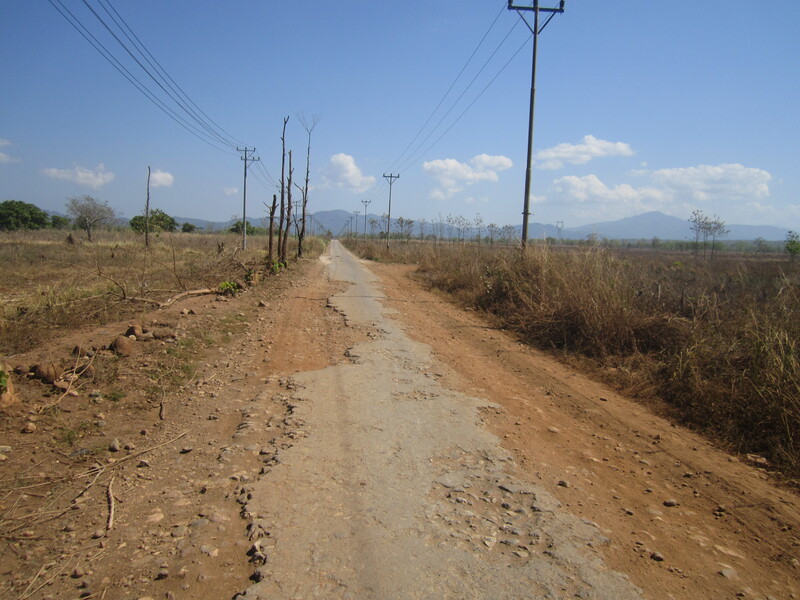 I then got a road for Dili. It was again a single track. One day it had been sealed. It was now in a complete mess. It continued to go down the Valley and away from the big mountains which was good. But the thing that worried me was that it was going away from the road I had marked on the GPS. So all afternoon I was left a little bit unsure. It was very nice cycling. The road opened out into a big open valley full of rice fields and other crops. The road then left the valley crossing a big new locking bridge to a small dirt road which was more like a farm track. I followed it and was getting more worried that at some point I would get horribly stuck and have to painfully back track. I was relieved when the broken seal returned. It meant it was at least a good road once to somewhere important. From the river I cycled about 10 km up this very skinny road. Some parts of the road had been washed away or in other parts half the road had sunk and was about to go which was the road I had chosen. I don’t think the locals have see many tourists. When some of the kids see me, they run. At 4 p.m. I stopped at a shop for a drink. I then asked if I could camp. Great – no problem. Then once I had my tent out they asked me to stay in the house. They spoke just about no English. They kindly brought me a cup of coffee and a bowl of corn to eat. I soon had 20 people around me mostly kids watching me eat. I then got up and went to my bike to get something and everyone followed. This happened more than once. One way to get them to scatter is to pull the camera out. I got my computer out and I then had 20 people looking over my shoulder. The only electric the family had was low voltage from one thing – a solar panel. Just enough to charge their phone and run a radio and a light. When it came to dinner it was just the father and I that ate. There wasn’t much food and I realised that what was left was then going to go out back to feed the rest of the family. So I only had a very small portion. So small that I woke up starving in the night and had to tuck into some emergency doughnuts. The bed had no mattress. I had to sleep on the bamboo base. I was tired and it was OK. I had a cup of coffee with the family. But I didn’t stay for breakfast. It was a lovely morning for cycling and I just got higher and higher. The scenery and the view were beautiful. I got to a small town and actually found a restaurant where I had some simple noodles and a hard boiled egg. I brought another 10 doughnuts for $0.50 knowing they would come in handy later. Climbing the mountain was slow going 12 km after 2 hours and 18 km after 3 hours. I didn’t mind the slowness because I will still be in Dili in the next few days and that will probably be the end of my short cycling stint in Timor Leste. Just before I reached the top I stopped and brought some oranges. They were so nice. Sweet and juicy. Coming down the other side was beautiful. The road improved. I have now rejoined the road shown on my GPS. On the way down I passed lots of small waterfalls and some under the shade of some very big trees. At 2 p.m. I got to Gleno. Quite a big town. I stopped for a big lunch at one of the restaurants and got some water. I then started cycling out of town. I only got about 500 m and I thought I am ready to stop now for the day. I| looked for a church. Then |I saw another restaurant. I went in and explained I was looking for somewhere to camp for the night. Straight away he said no problem. The guy spoke good English and took me down a gravel road beside the restaurant which passed some fish ponds and then to his house. In front was a small lawn on which I have now put my tent. Soon after I had the tent up he asked how many days was I staying. I said just the one. He then replied I could stay in the house if I wanted. It was good of him but I am happy to camp. He has brought me out a table and chair and I am relaxing in the shade. From the outside the house looked very new and modern. For western standards the inside didn’t look complete – sitting on a brand new lounge suite and looking at the underside of a tin roof looked odd. For dinner we moved next door to the old house which was very run down and the family explained it had been destroyed by the Indonesians in 99. The hard work from the previous days paid off. 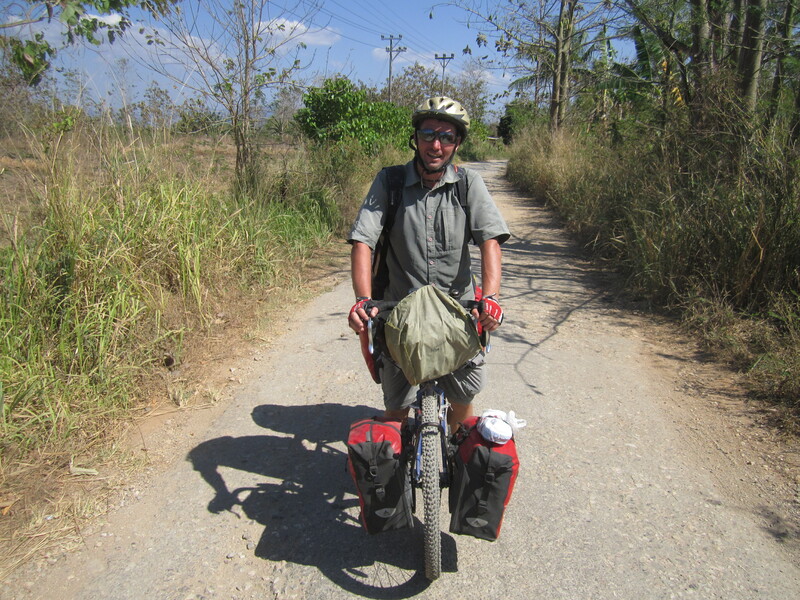 I had two small climbs and then it was all downhill to Dili. Again it was very scenic cycling down the valley. I met a UN police convoy of about 15 vehicles. That was nothing because when I was cycling into Dali I was overtaken by a massive convoy which just happened to be the arrival of the UN secretary Ban Ki-moon. What are the chances of us both turning up at the same time. I went to the Backpackers while he went off to the Presidential palace. Accommodation in Dili is more expensive than the rest of Asia. I have checked into a $12 dorm room. 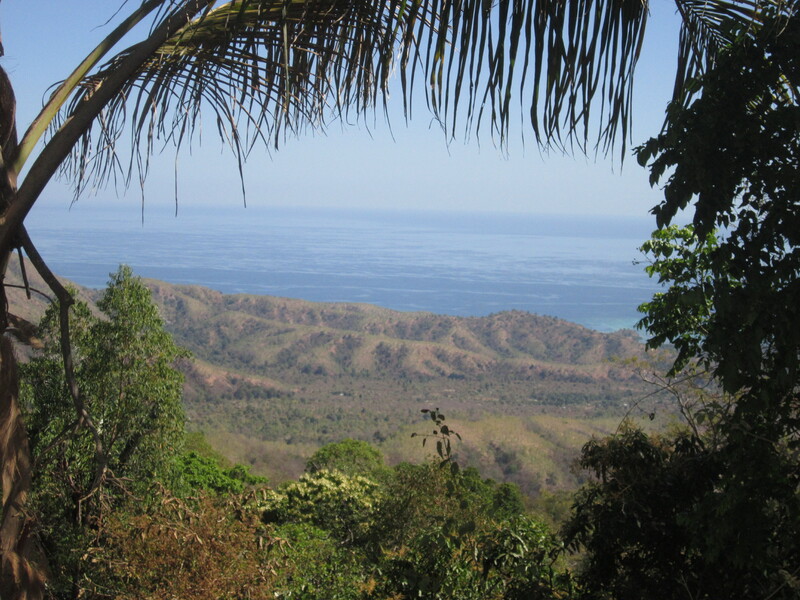 Being in the right place at the right time could be very true for Dili. I was just telling some fellow backpacker about my plan to find a boat to Australia and how difficult it is going to be when there was a spontaneous reply. Apparently on the hostel noticeboard is a note saying that someone is looking for one person to join a boat to Darwin on Saturday. DAY 503&504: DILI – REST DAYS. Day 503: Thursday – talk about being in the right place at the right time. Kym the captain and Ross the first mate came and saw me at the hostel this morning and after a little chat my bike and I got the thumbs up for $100. 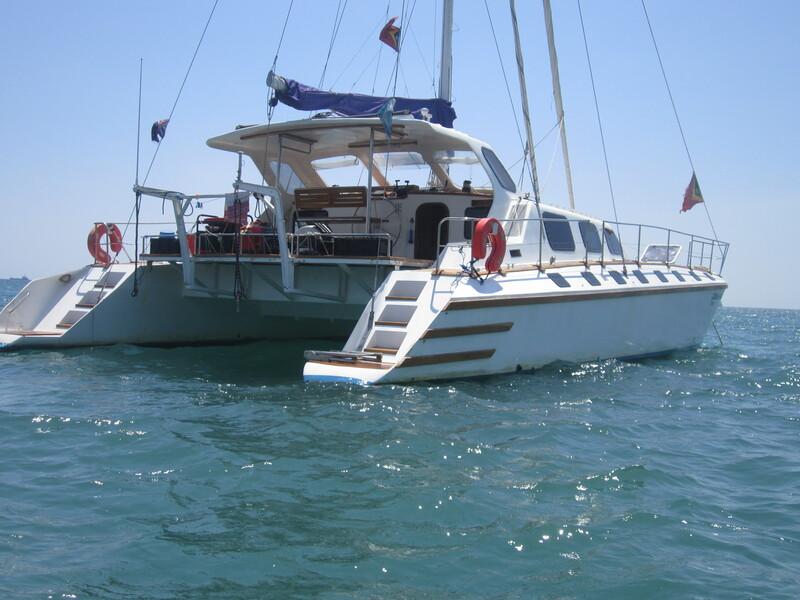 Friday night or Saturday morning, I am off to Darwin on a 14-metre catamaran. I am pretty lucky because at this time of year there are very few boats heading south. The Lorna Marlise just happens to be going back for repairs. I then had to spend most of the day cleaning everything in readiness for clearing Australian customs. Like New Zealand, they insist that everything is very clean. With departure within the next 24-36 hours I thought I’d better get out and see some of Dili before I leave. I went to the very modern Resistance museum which told the story of the Temorise fight against the Portuguese and then the Indonesians. I followed this up with a walk along the waterfront. I had a look and could see the Lorna Marlise moored a few hundred metres offshore and she looked all right. Day 504: Friday – Very exciting. I am moving onto the boat this afternoon. Still wanted to see a few things in Dili before I leave. So first off I walked up to the ex-Portuguese/ Indonesian torture prison with Martian a French guy staying in the guest-house. We then came back and I checked out of the guest-house…………had some trouble getting my $46 back as I had paid for 7 nights but ended up only staying 2. I won in the end……..but left her in a rage. Shame we didn’t part on good terms. I then put everything into a taxi. I had already taken the bike to bits. Getting down to the marina, we had to load everything into a little dinghy and ferry it out to the boat. I have a single bed right up the front in one of the pods. 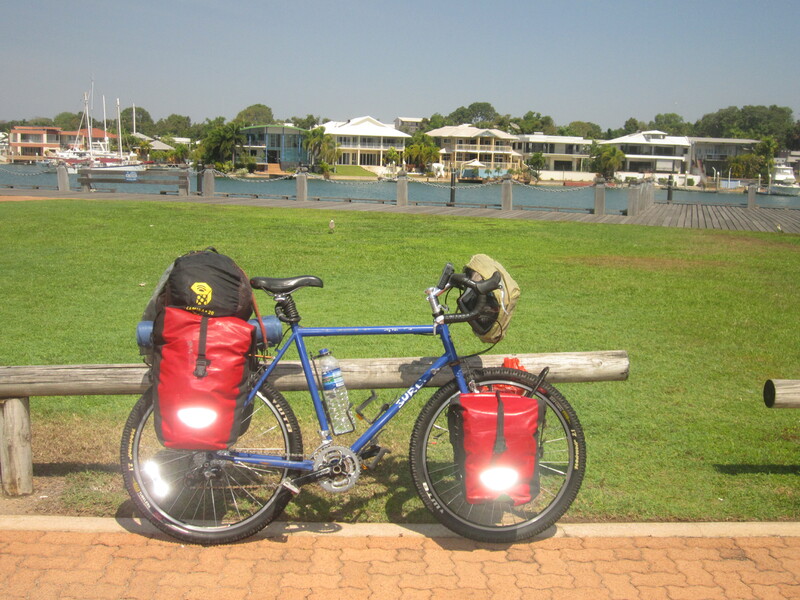 Here I stashed the tyres for the bike and my panniers. I put the frame of my bike in the boat’s dinghy which hangs off the back. I have been told if we need to abandon ship…..the bike will be going over the side. Don’t have to be back on board till 6 p.m. So I got off for the rest of the afternoon. 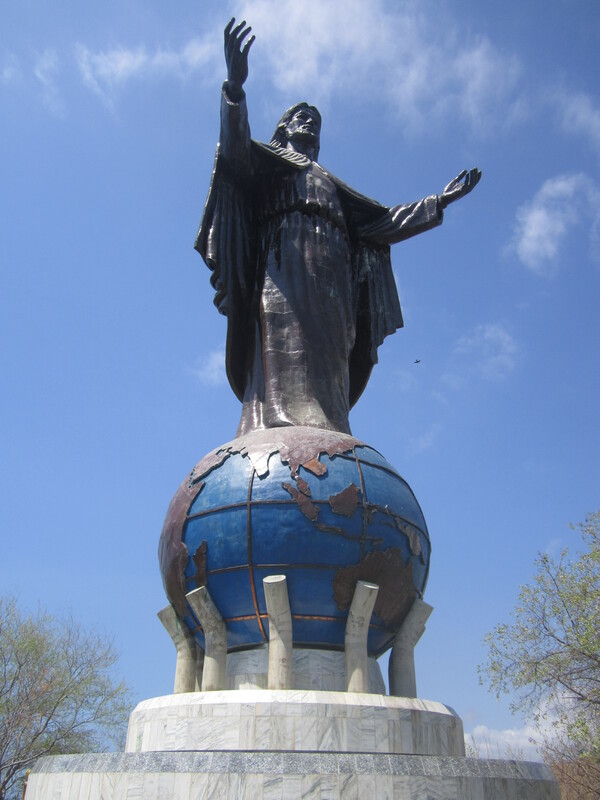 Went 7 km along the coast to see the big Jesus statue which is perched on the top of a hill looking back to Dili. The last thing before getting back on board was a trip to the supermarket to stock up on snacks for the next 6 days. I bought $25 worth of chocolate. That evening we had a few guests and a bit of a dinner party. Saturday: The spare parts for the boat finally arrived and at 1 p.m. we were on our way. There are just the 3 of us now, Kym, Ross and I. We were going to be 5. But at the last minute 2 people coming up from Darwin couldn’t make it. It means we will have to work a little harder. 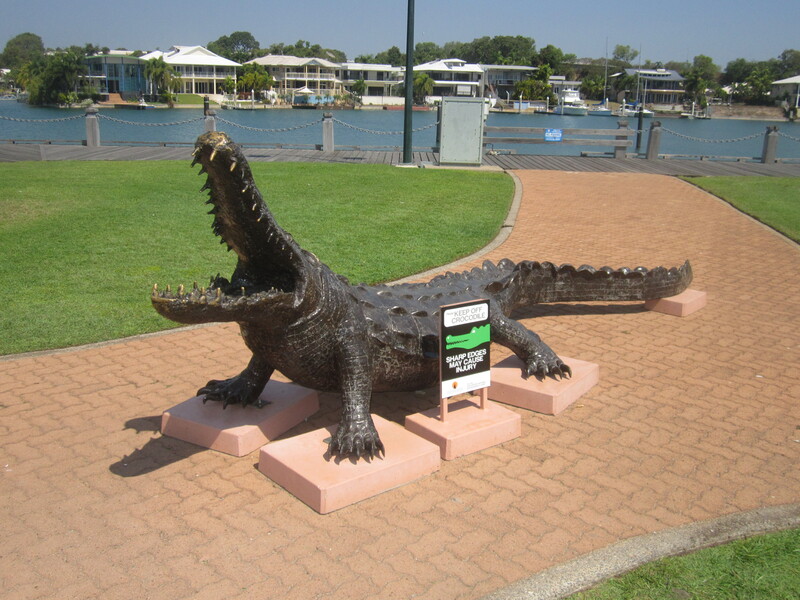 Our route for the next 6 days is along the Temorise coast and then down to Darwin. We started with one engine and the main sail. It was rough from the beginning. I took a seasick tablet straight away……..7 hours later, I could fight it no more. I filled a bucket in a very short time. In 17 months this was the first time I have thrown up. It was for the better because I felt alright afterwards. This sailing game is completely new to me. Missed the sunset because I was keeled over. Once the sun left it was pitch black. You could only see the stars, some shooting and the little lights from the villages along the coast. Then in quick time we had a number of incidents on the boat. The outboard motor on the back of the dinghy started to slip off. We had put a harness on and hanging off the back step of the boat got a rope around it and secured it back to the boat. Because it was rough and dark we couldn’t do much more. 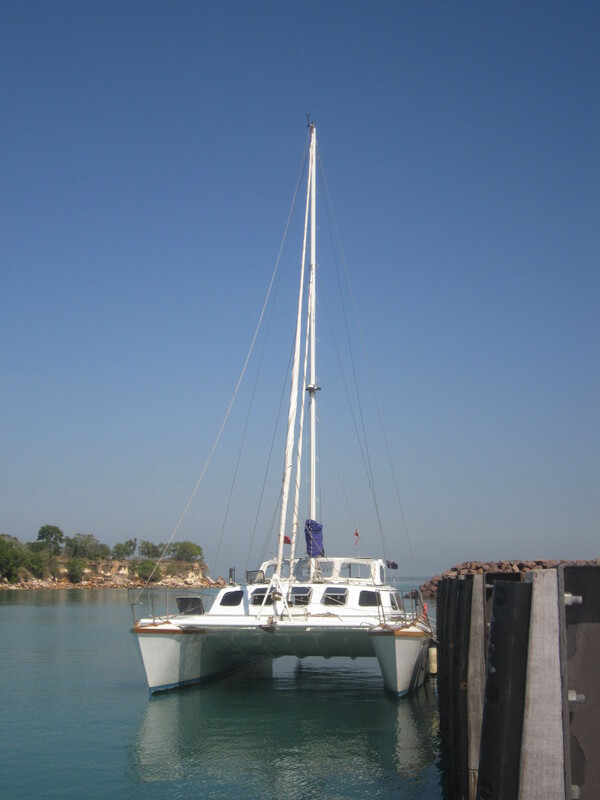 Then the boat’s steering went and we started going round in circles………….problem was a wire had come off. We all have to take turns of being on watch. Being a novice I stayed up with Ross to learn the ropes. It is difficult steering into darkness. 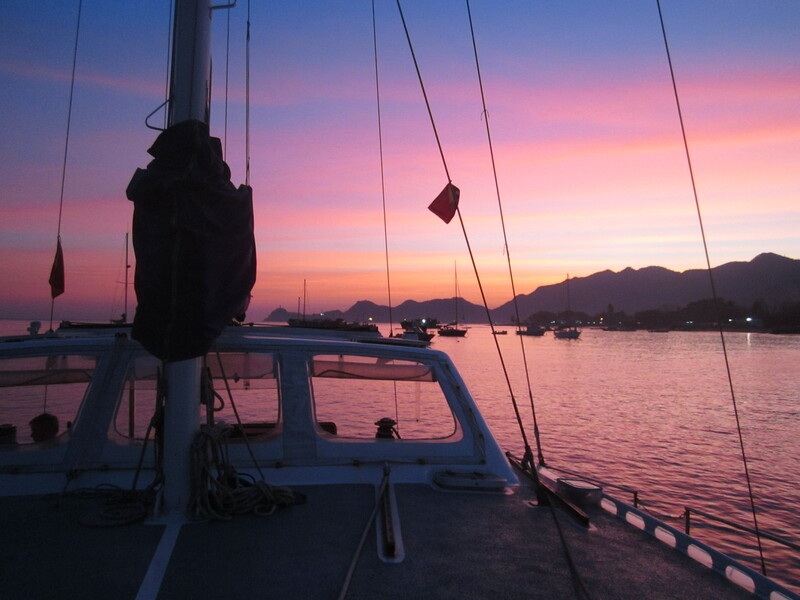 Around 2 a.m. we had a favourable change of wind and it was up on deck changing sails. 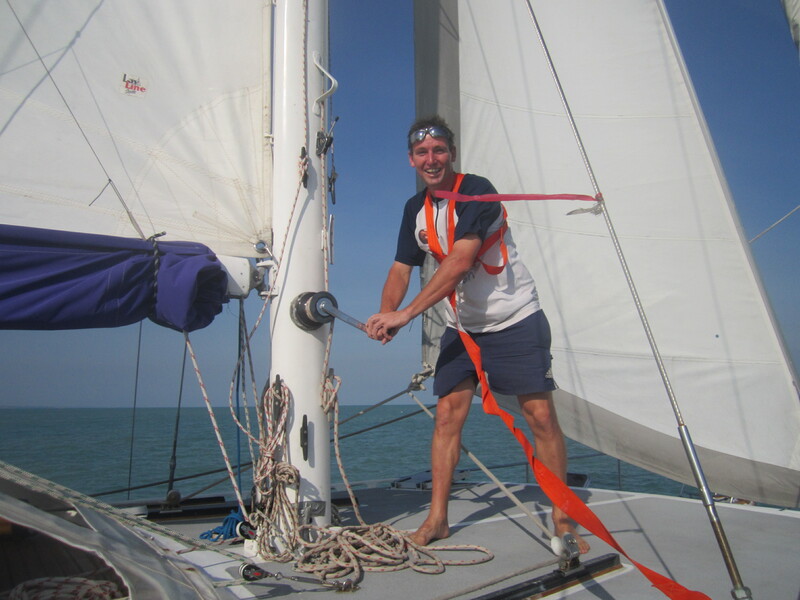 I have learnt how to tack – pulling sails in and letting them out again. With 3 sails up we turned the engines off and we were ripping through the waves. We might have beds but we don’t sleep in them. We all crash in the cockpit or close by. 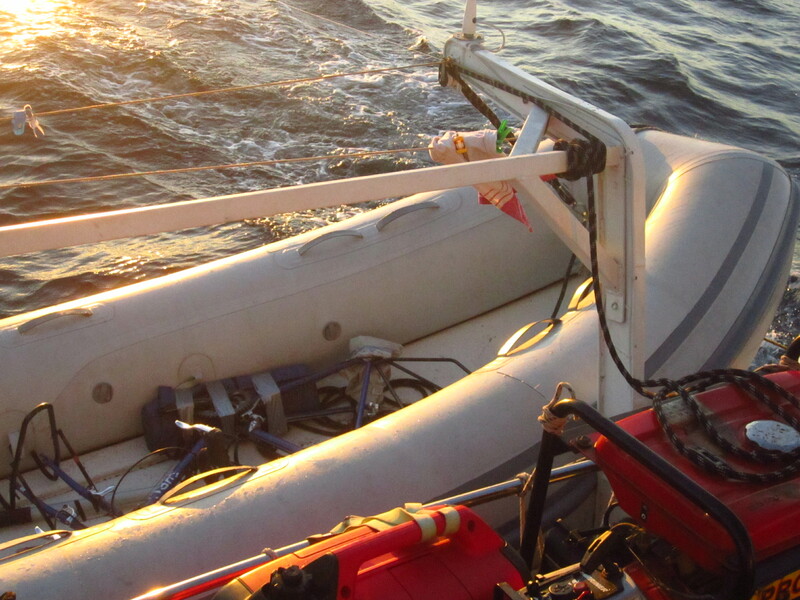 Sunday morning – waking with calmer waters we were able to reach the outboard motor and haul it back to the dinghy. I put a rope around my bike because yesterday it looked a little dodgy with the rough seas and the angle of the dinghy. Come 1 p.m., é4 hours into the trip we had done 177 km. In the afternoon we saw two freighters and that was it. 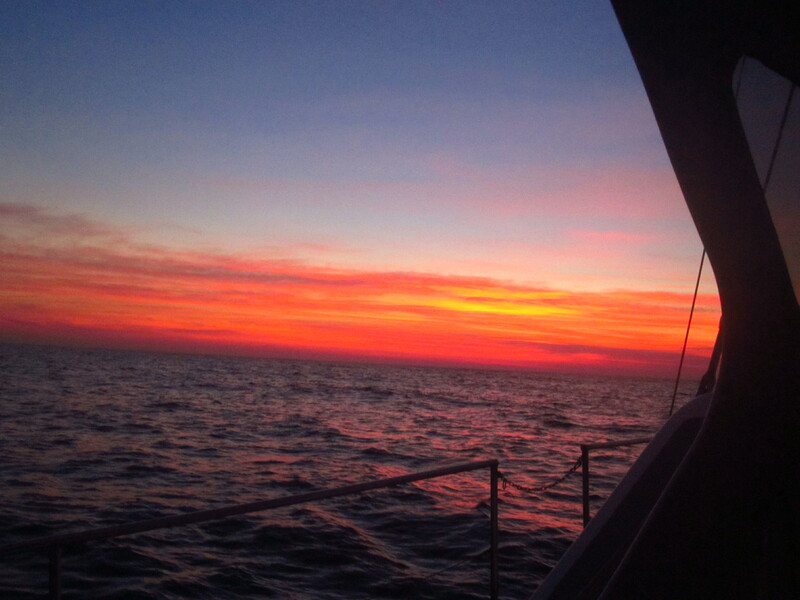 I have recovered from my sea sickness and I got to see a perfect sunset followed by a very quick setting of the new moon. Just before the sunset we saw some dolphins chasing fish come past the boat. We passed some Islands, but all you could see of them was a flashing lighthouse. 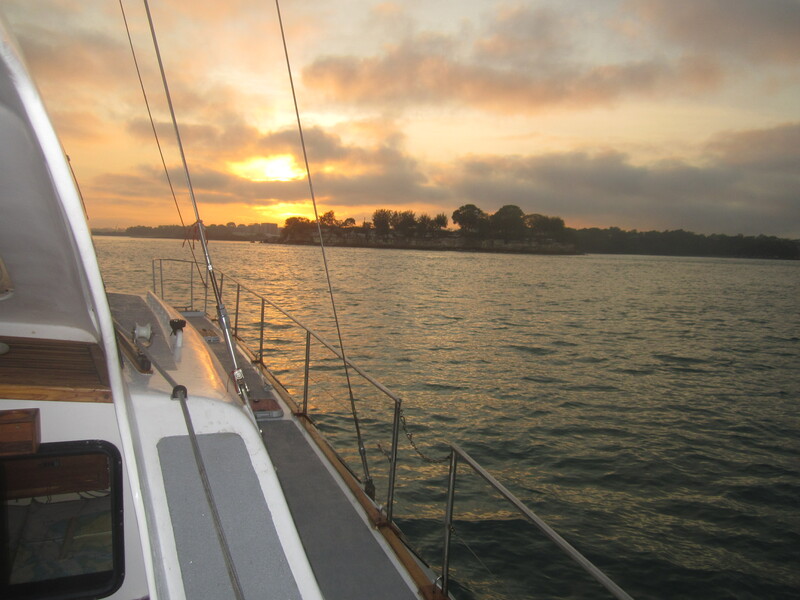 11 p.m. we did a sail change. I am starting to get the hang of this sailing. I have now been entrusted to do a watch on my own. You have to keep an eye on the autopilot and make sure we are still heading in the right direction and on the look out for Indonesian fishing boats with no lights and pirates. I was in the cockpit from 6:30pm – 8:30pm, 10:30pm – midnight and again from 2am – 4:30am. We are now in Australian waters. Monday morning, I got up after very little sleep and straight away we did a sail change. We are now in the open sea and there is nothing to be seen. At 1 p.m. 48 hours into the trip we had covered 397 km. We are eating very well on the boat. Kym cooked a chicken curry for the first night……..which I ended up having the next day for breakfast. It was steak sandwiches last night and tonight we had noodles,leftover steak and leftover chicken. The nights on the boat have been cold. I had to wear a thermal top and jacket. We are out in the middle of the ocean but still see a few birds flying around. Tuesday was an uneventful morning. In 24 hours we haven’t seen a single boat. 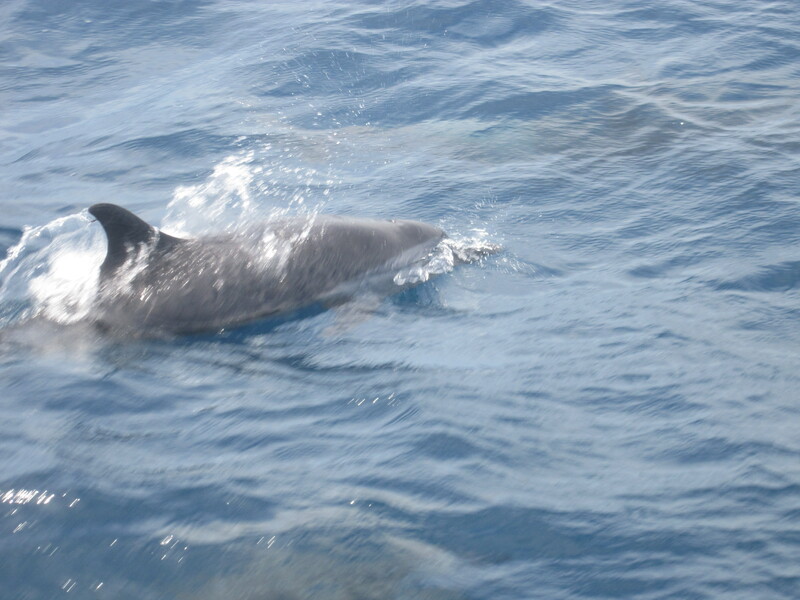 Then after lunch while I was on watch I spotted 100 dolphins come over and join the boat. They stayed for over an hour playing with us. It was a wonderful sight. I went up to the front of the boat. I felt as though I could reach out and touch them, they were so close. Less then an hour later we had more visitors with a very low fly pass by the Australian coast guard. They then contacted us to find out who we were…………..actually they all ready knew. I guess it was just to confirm. 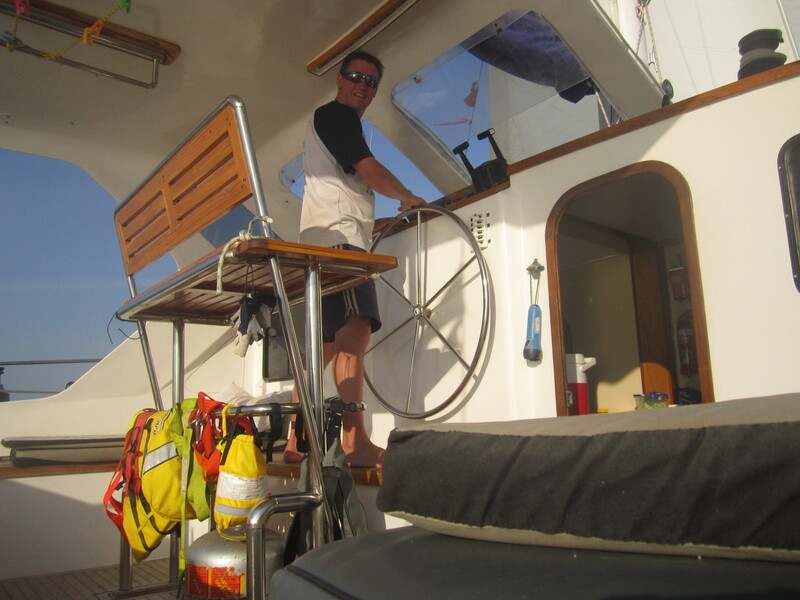 At 1 p.m. today we had sailed 611 km in 72 hours. 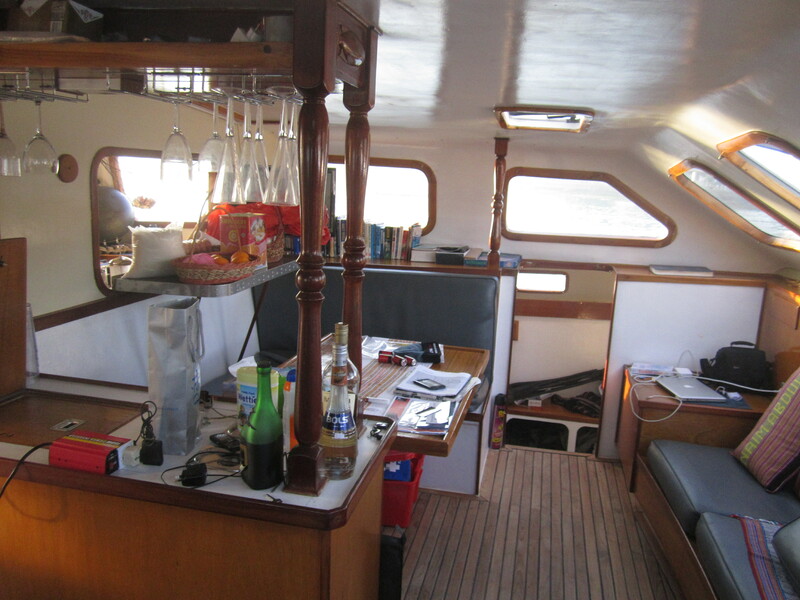 I said we eat well on the boat and this afternoon we had the BBQ out on the back deck cooking a New Zealand lamb roast. Wednesday. We are now entering into our 5th day at sea. Mid-morning we had another low fly-over by the Australian customs. The sea is very flat and we have had to motor a fair bit. Come 1 p.m. we had done 802 km in the last 96 hours. 2 p.m. we spotted land for the first time in a few days. Bathhust Island was my first sight of Australia. Tomorrow morning – Darwin will be the real Macoy. There is never a bad sunset out here. Every night it is just absolutely beautiful. We were under sail for the latter part of the afternoon. We had a good wind and at this speed we were going to arrive in Darwin at midnight. 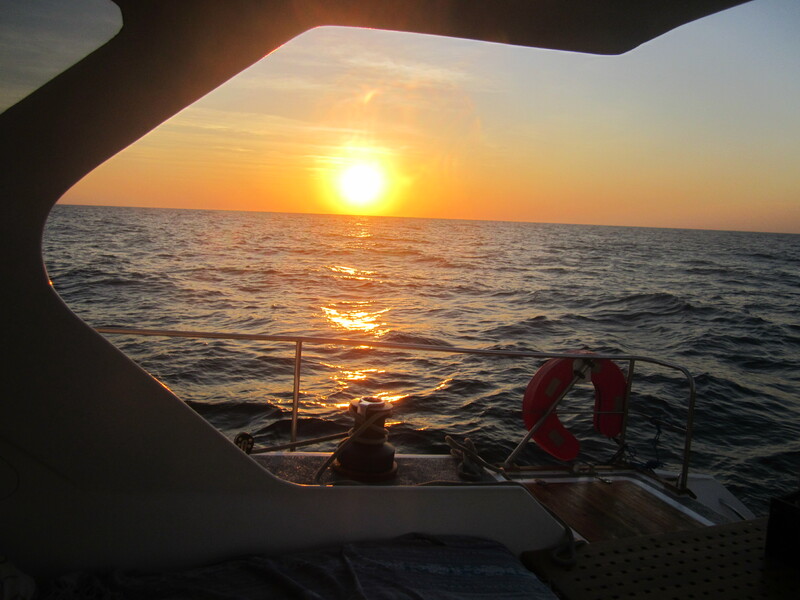 So we had to drop the sails to reduce the pace so we would have an arrival in Darwin shortly after dawn. I went on watch at 9 p.m. and stayed in the cockpit till 4 a.m. It was a little nerve-racking looking out into the dark and knowing that by getting closer to Darwin there would be a bit of traffic around.